The People’s Progressive Party on Wednesday sought to sully the one-man Commission of Inquiry into the Lindo Creek massacre 10 years ago, but President David Granger said that incident and two other massacres, among other killings, occurred during then President Jagdeo’s 1999 to 2011 tenure but he had failed to conduct a thorough probe. The PPP said its members might be unwilling to testify before such a Commission of Inquiry because of apparent inherent bias and conflict of interest involving the Inquiry Commissioner, Retired Justice Donald Trotman. volumes about the nepotistic tendencies of the current Administration. The Party is also concerned that only one Commissioner has been named on such a sensitive Commission,” that party said. Also of concern to the PPP is what it said is government’s decision to break from the convention of involving the opposition. 2008, at the Lindo Creek mining camp, Upper Berbice River. to the partisan approach in establishing the Commission, which does not inspire trust and confidence, persons with vital information may be reluctant to come forward,” that party said. decision to start an inquiry with the incidents at Lindo Creek, as opposed to a more comprehensive review of the crime wave. However, President David Granger defended his decision to begin with the Lindo Creek massacre, saying that would lead to the unravelling of the criminal network and exposure of operatives, who were responsible for the reign of terror, during the most deadly decade in Guyana’s history, while also ensuring that justice is served for the affected families. Speaking to media operatives at State House, at the conclusion of the Accreditation ceremony for the new Cuban Ambassador to Guyana and minutes before retired Justice Trotman was sworn in as the Commissioner for the COI at the Ministry of the Presidency, the Head of State said that the Government is committed to finding the perpetrators and intellectual authors of the killings and ensuring that justice is served. “This is really a massacre of the innocents and we feel that the way in which the investigation was handled indicated that there was a high level of collusion by the Government of the day. We feel that this will be a pivotal investigation, which will unravel the criminal network, which was behind the killings in what is now called the ‘Jagdeo era’, during the ‘troubles.’ When we see the report of this Commission of Inquiry, it will lead to other Commissions. You know [there was the death of a former Minister]; it is really beyond belief that a President of a country could have one of his Cabinet Ministers assassinated and not even hold an inquest or an inquiry,” the President said. Responding to public comments made by Jagdeo, who was President, during the period of the ‘troubles’ and has said that he dares the Government to go ahead with the Inquiry and will cooperate, President Granger said that the former President has a duty to come forward and be truthful with the Guyanese people. In a recent statement, Mr. Jagdeo is also quoted as saying that the Commission of Inquiry set up by the Government will polarise the nation. “If he… has all this information, then why not investigate the death of a Cabinet colleague? Starting with Lindo Creek, I think it will help us to unravel the whole tapestry of criminality that engulfed this country between 2000 and 2008. A Commissioner has been appointed and the recommendations he will make I am sure will be based on evidence he will receive. I was very heartened by the fact that the Opposition leader claims to know something of this period. I hope that he will come forward to give evidence and let the people of Guyana know what he knows… What has polarised the nation is the killings, the ‘troubles’, the death squads, Ministers using state letter heads to sign for people to get permission for equipment. That is what polarised this nation. The role of the Government under President Jagdeo polarised this nation more than anything else in our history,” the President said. During most of the decade referred to by the Head of State, Guyana witnessed its most intense sustained wave of criminal violence since Independence. According to the President, there were 1,431 murders during that period. 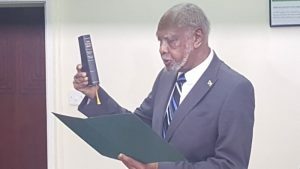 In accordance with Section Two of the Commission of Inquiry Act, Chapter 19:03, Justice Trotman was sworn in as the lone Commissioner at the Ministry of the Presidency before Chief Magistrate Ann McLennan and Minister of State, Mr. Joseph Harmon. In brief remarks to members of the press, Minister Harmon said the Commission of Inquiry has been appointed under the direction of the President. Referencing the Terms of Reference (ToRs), the State Minister said that the Commissioner has been directed to investigate all matters in relation to the death of the eight miners. He said that it is the Government’s responsibility to provide answers to grieving families, whose quest for justice has not been realised despite the number of years, which have passed. “The Commission of Inquiry will make recommendations on actions to be taken against all persons and or organisations that are deemed responsible for the death of those persons. We, as a Government, feel that such an inquiry is necessary to determine precisely what happened to our citizens at Lindo Creek. Justice Trotman is a distinguished retired judge. I am confident that the Inquiry would be conducted at the highest professional level. I urge all persons who may have information to cooperate with the Commission. The Government will provide the resources and will do everything possible to support the work of the Commission,” he said. Minister Harmon added that the Commission has been given wide scope to conduct their work and it is expected to carry out its functions in an independent, fair and impartial manner. Justice Trotman, in a brief address to the media, said that he remains committed to completing the task in a highly professional manner. “To find the truth is sometimes difficult. Knowing the truth in circumstances such as this is of the greatest importance. In a wider sense, we cannot be really free both the families and as a nation unless we know the truth, we want to do what is right and we do it to the best of our ability and according to the morals of our conscience. The main objective of this inquiry is to find the truth, to bring healing and closure to the families, relatives and all those who require justice to be done in this particular instance and to bring healing and closure to the nation as a whole,” he said. The Commission will commence work on February 1, 2018 and has three months to complete its work. However, if a request is made to the Head of State for an extension to the timeline, this could be granted depending on the reason (s) given.